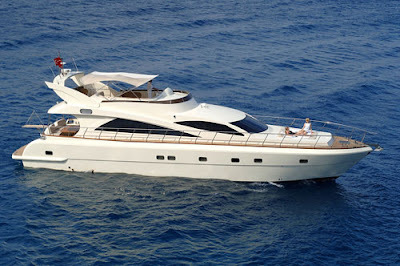 Narissa is now available for charter in Greece and Turkey. There are 3 cabins. 1 Master Cabin , 1 VIP Double Cabin, 1 Double Guest Cabin. All cabins are en-suite with showers and heads. Self controlled air-conditioned and LCD TV, DVD player and music system in all cabins and saloon. Moreover, music system available in fly bridge. Click here for more photos and information on charters.